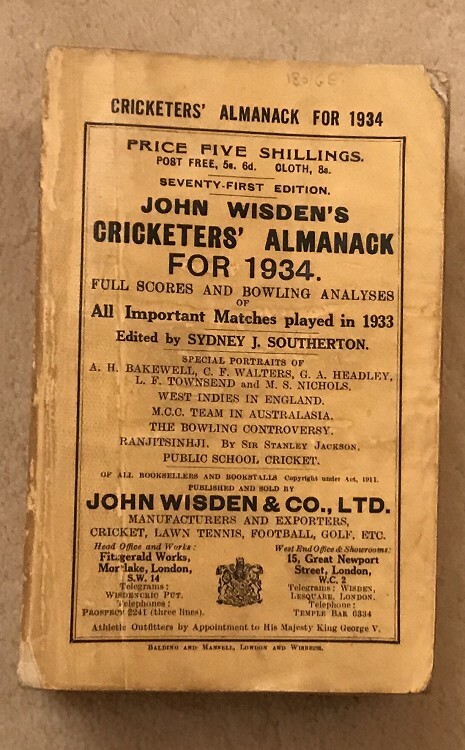 This lot is an Original 1934 Wisden Paperback. In Very Good Condition. This book has a great spine with nearly complete spine paper, some wear down one edge , the covers have some light wear with rounded/loss to the corners, nice inside, odd bit of thumbing to the top corners but nice photoplate and bat bookmark which is nearly complete, handle missing. Crease line (in apperance , not a fold) to the front cover. Hardest 1930 to find. Covers the bodyline controversy.